Beeke in bad company - and taking good men with him!! In September past, Joel Beeke was advertised as preaching at Bell Creek Community Church in Livonia, Michigan, USA. Bell Creek Community Church is firmly in the “contemporary worship” camp! Clanging cymbals and raucous guitars are all the rage there. Throughout this church website there are references to the “Desiring God” website as these images illustrate. “Desiring God” is the website of John Piper. Bell Creek Com­munity Church is clearly in the “New Calvinist” camp! Piper has been repudiated by fundamentalists of the old school because of his music and his associations with men whose theology is questionable. Joel Beeke places himself in the Piper camp when he preaches at a church which openly associates with and pro­motes John Piper’s teaching. It is not so very long ago that Dr Beeke indicated to some ministers of the Free Presbyterian Church of North America, when challenged by them about his associations with Piper, that he basically repudiated Piper’s ministry and yet he is happy to promote his books through his Reformation Heritage Books’ site and likewise promotes Piper and becomes associated with his ministry by preaching at Bell Creek Community Church. 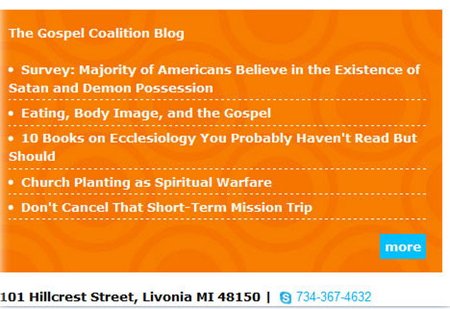 Links to The Gospel Coalition Blog on the Bell Creek Community Church website also signify its spiritual pedigree! This coalition is very much a mixed bag!! Amongst its Council members are many signatories of the Manhattan Dec­laration, a thoroughly ecumenical socio/religious document which prominent members of the Roman Catholic Church and other theological vagabonds have signed, as a perusal of the list of signatories will soon reveal. Dr Beeke has become illustrative of the character in John Bunyan’s “Pilgrim’s Progress”, Mr Facing-Both-Ways! It just depends upon whom he is speaking to as to which way he is facing! How Dr. Beeke’s meetings were announced on the Emmanuel Church website. In September of this year, Dr Beeke visited England for a confer­ence in Emmanuel Church, Salisbury, where the minister is Mr Mal­colm Watts. He spoke at a number of meetings there on 27th and 28th September. However, before the meeting in Emmanuel on 27th, he spoke at an Elim Pentecostal church in the afternoon. Again, we have Dr Beeke associating himself with the unscriptural music of the modern “contemporary church” scene with its “wor­ship band” as well as endorsing the theological errors of modern Pentecostalism. An announcement taken from the Facebook site of Elim Christian Centre, Salisbury. The website also lists a woman as its Assistant Pastor. The Elim Christian Centre in Salisbury states on its website that it is part of the Elim Church movement. On this Elim site you have an example of the music that doubtless the Elim Christian Centre indulges in. See this link. The Elim Church in Salisbury is openly in the ecumenical camp for it promotes the “Alpha Course” which is heavily endorsed by the Roman Catholic Church. Furthermore, the Elim church in England is listed as being a member of the “Churches Together in England” organisation. This is the body which replaced the “British Council of Church­es” in 1990 and which coordinates ecumenical events and happenings in England. Dr Beeke is really in bad company here!! Therefore, this engagement by Dr Beeke at the Elim Christian Centre in Salisbury seems completely incompatible with his speaking, but some 4 hours later, at Mr Malcolm Watts’ church conference. Mr Watts, in an article entitled, “The Crumbling of Evangelicalism”, set forth his views on Pentecostalism and the Charismatic Movement and the harm they had done to the cause of God’s Truth very clearly. In recent years, due to repeated attacks on fundamental biblical doctrine and principle, the cause of Truth among us has been terribly undermined. The results are for all to see. Ministers and churches, once known for their faithful stand, have been moved from their formerly held positions (in many cases without realis­ing it) and are now in a state of complete confusion. Mr Watts then lists three movements he deems responsible for the attacks on Biblical doctrine which have resulted in the undermining of the cause of Truth - 1. The Ecumenical Movement. 2. The Charismatic Move­ment. 3. The Neo-Evangelical Movement. “The second movement responsible for shaking the foundations of the evangelical world is the charis­matic movement. As a modern variant of Pentecostalism, this movement swept through Christendom in the 1960s and 1970s under the ministries of men like David du Plessis, Michael Harper and David Watson. It resembles Pentecostalism in its emphasis on one post-conversion experience and the consequent reception of spiritual gifts, notably the gift of tongues. It differs, however, in its international character and open ecumenical associations. A few years ago some were saying that the charismatic movement was dying, but, phoenix-like, it seems to have risen from its own ashes, first in the form of the house church movement, and more re­cently in the form of the restoration movement. While maintaining its basic charismatic features it has also developed a belief in the restoration of apostolic and prophetic ministries as being vital for the es­tablishment of God’s kingdom. Within evangelicalism, attitudes towards the charismatic movement have changed. At first there was high-level criticism and even denunciation. In the 1960s, for example, Dr Stephen Short wrote against ‘the doctrinal error into which many in recent times have fallen respecting the subject of baptism in the Spirit’. Mr Watts calls the Charismatic Movement “a modern variant of Pentecostalism” and of course it is just that. Charismatics hold the same basic doctrines on the Holy Spirit as do Pentecostalists. The many condemna­tions he lists in his article against Charismaticism can, with equal justification, be levelled against the Elim Pentecostal church at which Dr Beeke spoke just before his speaking at the conference services in Mr Watts’ church. That church is in the the ecumenical camp by its links with “The Alpha Course” and its involve­ment with the Roman Catholic Church. Does this mark a shift in Mr Watts’ position? Who can deny that it must! The Salisbury Elim Centre where Dr Beeke fellowshipped holds many doctrines in common with those who are rightly condemned for their betrayal of the truth of God by Mr Watts in his article. By having Dr Beeke, Mr Watts and his church have associated themselves in fellowship with the very movements which hereto­fore they condemned. What Mr Watts has to say in the first section of his article, entitled: “The Ecumenical Movement”, on men changing their positions toward the errors promoted by ecumenism is worth reading carefully. It highlights in the recent past what men such as Joel Beeke are repeating in our day and which Mr Watts is apparently in grave danger of endorsing! Near the conclusion of Mr Watts’ article, “The Crumbling of Evangelicalism”, he writes these words. Secondly, let us contend for the biblical doctrine of separation. One of the greatest weaknesses of evan­gelicalism in recent times has been the failure to take a separated stand from apostasy, yet the Word of God is absolutely clear on this. We are told to separate from all co-operation in religious activities with those who deny the cardinal truths of the Christian faith, and no consideration of expedience should ever incline us to do otherwise. The apostle Paul tells us to - mark them which cause divisions and offences contrary to the doctrine which ye have learned; and avoid them (that is - have nothing to do with them) (Romans 16:17). There is to be no fellowship at all with those in serious doctrinal error. We must - come out from among them, and be... separate (2 Corinthians 6:17). We are not to receive them (2 John 10). We are to reject them (Titus 3:10). If any man... consent not to wholesome words, even the words of our Lord Jesus Christ, and to the doctrine which is according to godliness... withdraw thyself (1 Timothy 6:3, 5). Scripture therefore forbids us to be in any kind of association with those who are doctrinally unsound; and to disobey the Word of God in these matters is to be guilty of sin. This duty raises another matter. What should our attitude be to those who are apparently evangelical believers, and yet who disregard all these commands, choosing to remain alongside unbelieving people in doctrinally mixed church associations? We should certainly try, by every possible means, to win them over to the scriptural position on separation. But if they turn a deaf ear to God’s Word, though we know them to be fellow-Christians, we shall be obliged to show our disapproval by restricting public and church fellowship with them. If any man obey not our word by this epistle, writes Paul, note that man, and have no company with him (literally: be not mixed up with him), that he may be ashamed. Yet count him not as an enemy, but admonish him as a brother (2 Thessalonians 3:14-15). We concur wholeheartedly with these sentiments but we believe also that they are incompatible with an as­sociating with Dr Joel Beeke who, despite numerous warnings and admonitions, has persisted in companying with and the promotion of those whose theology and behaviour are unscriptural. Mr Watts, it must be said, must be honoured for the sterling work that he has done for the cause of Christ through his ministerial labours and writings and also his work in The Trinitarian Bible Society. We do not hesitate to say this. It is therefore all the more distressful to see his stand threatened by his links with Joel Beeke and his compromising ministry. Sadly, he is but one of many, who despite brotherly warnings seem to have decided to “turn a deaf ear to God’s Word” and refused to heed the evidence produced to support the warnings of Joel Beeke’s wrong. No good can come of this. We are heading for a repeat of the folly wrought by many in the wake of Billy Graham’s errant ways. Mr Watts is but one of many who has been brought into company he otherwise would have nothing to do with as a result of his fellowship with Dr Joel Beeke. When will he, and the others like him, say with Joshua, “ . . choose you this day whom ye will serve . . . . but as for me and my house, we will serve the LORD,” Joshua 24:15, KJV. No matter how our words may be construed, the Lord knows the desires of our heart.